What’s in the waters of Cape Cod and Plymouth Bays? We found out on October 25. 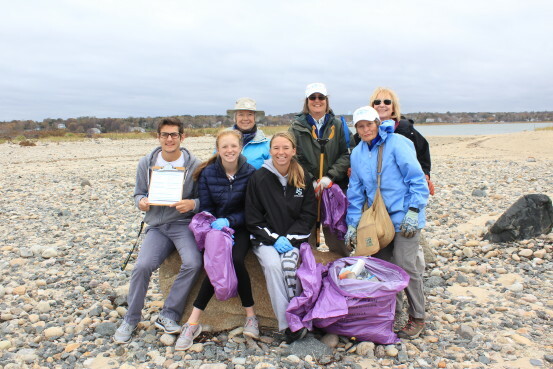 Less than a mile from Plymouth Rock, thirty-four volunteers joined me on Long Beach to participate in COASTSWEEP, a Massachusetts-wide effort to identify, count and remove marine debris, which can be harmful – even deadly – to humans and wildlife, reduce scenic beauty, and cause navigation hazards. We walked both sides of the barrier spit, on the sandy beach, the cobbles and next to the marsh to find human-made trash that had washed out of the ocean. 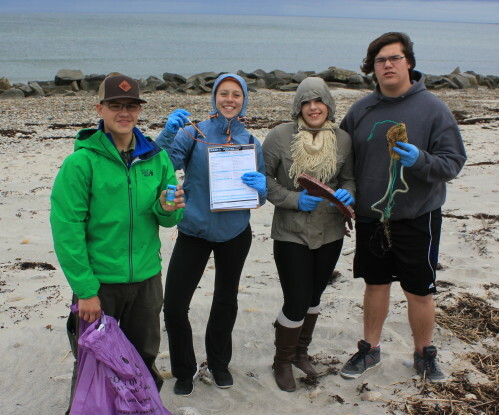 What we found surprised many of the participants – students from Plymouth North and South and Middleboro High Schools, Beach Ambassadors (Goldenrod Foundation’s volunteer corps), and other Plymouth residents. Plymouth South High School students Spencer Mazzola, Ella Heenan, Isabelle Hopkins and Jonathan Chandnoit hard at work. The most ubiquitous item was rope with 239 lengths collected and many times that amount left on the beach in twisted bundles too heavy or too buried in the sand to remove. Encountered almost as frequently were pieces of small plastic, the so-called tiny trash – 233 pieces were collected. Third most numerous were plastic beverage bottles – 226 of them. We also found plastic bags, cigarette butts, aluminum cans, tennis balls, construction materials, fishing line, strapping bands, toys, clothing, spent fireworks, balloons, plastic utensils, cigarette lighters, a cooler, shotgun shells casings, foam articles, netting, personal hygiene products, straws, bottle caps and more. Compared to the 2014 results for Massachusetts, we found all of the common trash items and more rope and derelict fishing gear than average. 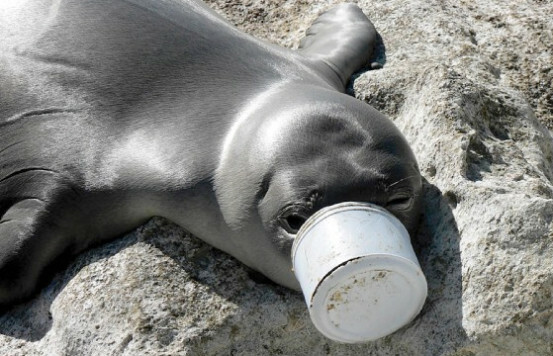 Our data in this citizen science project will go into an international trash database maintained by Ocean Conservancy used to identify sources of trash and work toward pollution solutions. Participants were impacted by their findings – appalled at the variety, disgusted by the amount, and, I hope, motivated to cut down on the trash that they create. To that end, everyone who participated received a prize – a reusable substitute for the most common disposable items found. For instance, prizes included metal straws, cloth grocery bags, bamboo utensils and snack packs provided at a discount price by Ecomaniac Company, and to go mugs (thanks to Colony Place Starbucks). 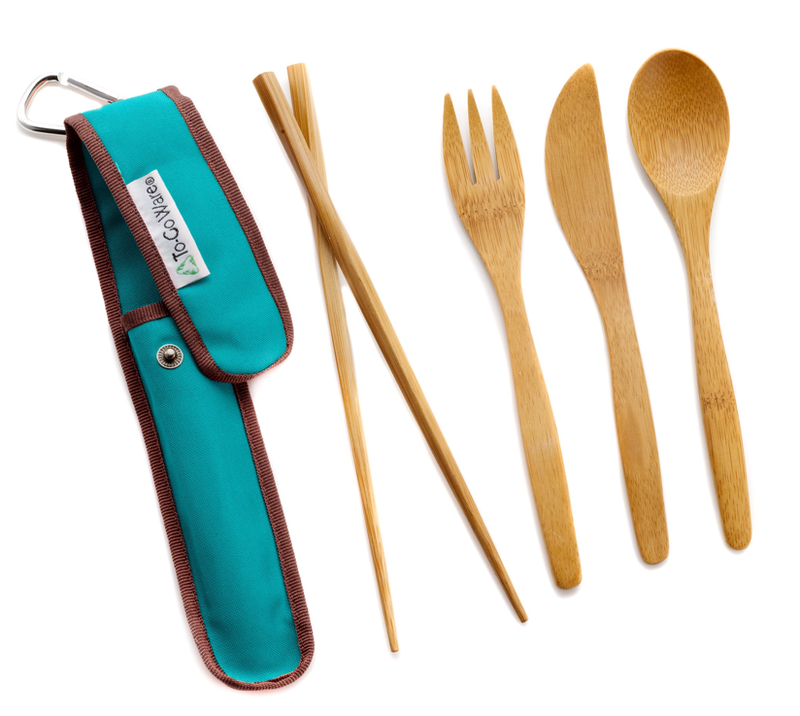 Bamboo utensils in a handy holder – one of the prizes given out. 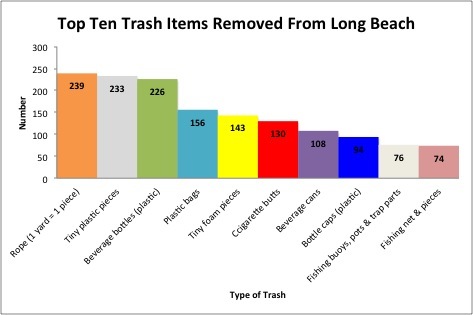 Other ways to reduce marine debris, 90% of which comes from land-based locations, include introducing legislation to ban single-use disposable plastic bags or to impose a deposit on beverage bottles, incentivizing recycling and using biodegradable materials in place of plastics. Outdoor work, education and fun – a great combination! Shown here (left to right): Greg Pappas, Jordan Colbert, Sheila Sheridan, Shannon Colbert, Lisa Meeks, Janice Spence and Carolyn Collins. Big thanks are in order to all of the participants! Top photo credit: Janine Gustin.